Grocery shopping is the first step to creating a healthy diet, as you build your food arsenal. If you buy healthy delicious foods then these foods will become the basis of your diet, building a healthy lifestyle. Most likely, college is the first time you are ever shopping just for yourself, without the help of your parents. This can make grocery shopping a little overwhelming! Many students have trouble knowing exactly how much they need or what the best foods are to get. We’re here to help! Make a List! Think about your meals for the next couple of days, and build your shopping list around that. Students often find it helpful to break down the list according to what section of the grocery store the food is located. Nothing is more frustrating than walking the length of the grocery store numerous times. Check out our website for tips on creating a healthy shopping list. Don’t shop hungry. When you hit the grocery store with a growling stomach, you’re more likely to buy food that wasn’t on your list, increasing your grocery bill. Start in the produce section Fill your cart with color and stock up on a variety of fruits and vegetables. Look for what is in season for items that are both cheaper and more flavorful. If you don’t have time to cut and prep vegetables at home, check out the pre-washed bags of salad, or pre-cut vegetables. Stick to the side Focus most of your on the grocery store’s perimeter, where more of the nutritious foods including fruits, vegetables, lean proteins, milk and low fat dairy products are found. Don’t forget to do a loop of the inner part of the store for your whole grains (pastas, rice, cereals, crackers, and popcorn), canned beans, sauces and salad dressings. 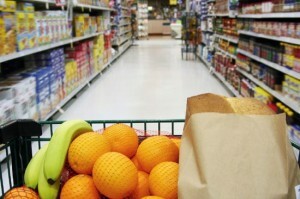 Are you intimidated by grocery shopping? Are there any questions you have about it? Red Soxs are playing today in Fenway-if you’re cheering them on in the stands, follow registered dietitian Joan Salge Blake’s tips for eating well at the ball park! It’s really a great and useful piece of info. I’m satisfied that you shared this helpful info with us. Please keep us informed like this. Thank you for sharing.